Rose scored three points in 20 minutes with three turnovers, missing all three of his field goal attempts coming off the bench behind Kyrie Irving. Rose also had an assist and a rebound. But Rose was active on defense, took a hard hit on an up and under drive which ended up in a pair of free throws, beat the defense on a drive and left handed finish which he missed, dove out of bounds to save a DeMarcus Cousins miss and was fouled retrieving the loose ball and hustled back on defense to deny Goran Dragic a shot after a turnover. Rose showed no ill effects from Friday’s win in New York when Rose had sat out the previous game and two practices. At this point, it’s likely USA Basketball and the Bulls will gladly take a physically fit Rose over an effective Rose. They’re hoping for both, and there seems now little reason to believe they won’t see that as well. It wasn’t a particularly inspiring warmup for the USA to suggest it can win this tournament. The USA’s shooting overall was poor, horrific from the free throw line at 29-46 and less than 50 percent on two-point field goals with most of those attempts being dunks and layups. Two of the USA’s better shooters, Stephen Curry and Klay Thompson, had foul trouble and there was a lot of individual isolation play from the guards with just 13 assists on 33 baskets. USA big men, Anthony Davis and Kenneth Faried thus carried the team, primarily with their quickness and activity on second shots. Davis had 18 points, nine rebounds, five blocks and three steals and Faried had 14 points and eight rebounds. But that was against a relatively small Slovenia team whose big men played more outside. Davis and Faried wouldn’t have that sort of impact against a truly big team, like Spain has with Marc Gasol, Pau Gasol and Serge Ibaka. But the tournament breaks the best way for the USA team as it wouldn’t face Spain until a potential gold medal game. The USA has the theoretically softer pool play, starting Saturday with Finland (and former Bull Erik Murphy), the Dominican Republic, New Zealand, Turkey with Omer Asik and Ukraine. Spain is in a more difficult pool with Brazil and France, though expected to be the top team from that pool group. The USA’s games are in Bilboa and then the surviving teams move to Barcelona or Madrid for the quarter finals, which are single elimination. The finals are in Madrid Sept. 13 and 14. The only change in the USA starting lineup, as it was in the second New York City exhibition games last week, was Irving for Rose along with Curry, Davis, Faried and James Harden. Though the starters maintained the lead and had a good run to start the third quarter, that group of guards doesn’t pass the ball regularly and didn’t show much with drive and kick plays. Irving had 13 points and Rudy Gay had 11. Coach Mike Krzyzewski said he’ll consider whether to start Irving or Rose, and they did play together some as well. Rose did make a nice drive and kick pass for a three to Thompson. Rose, though, was loose with the ball in his 20 minutes and mostly played around the perimeter with not many individual offensive forays. Rose, however, moved swiftly and without any hesitation on offense and defense. The stars for USA Basketball Tuesday clearly were Davis and Faried with their hustle. They even combined on big man to big man plays with Faried throwing a lob for a Davis dunk and Faried dunking on a step through move after an inside pass from Davis when the USA broke the game open in the third quarter with a 22-4 start. It was a stumbling opening for the USA with several turnovers and uncharacteristically poor perimeter shooting, which continued throughout. Rose first entered with 5:27 left in the first quarter with the USA leading 10-4. He was immediately fouled on a drive and missed both. Rose then took a pass underneath and was bumped as he went up, making one of two free throws. Gay and DeMarcus Cousins combined for a late first quarter spurt and then late in the first Rose beat the perimeter defense but had a left handed layup attempt roll off as the USA led 24-18 after one quarter. Faried was keeping the USA ahead, scoring on an offensive rebound to open the second quarter and then a save when he tipped a loose ball to himself. A 12-0 start to the second quarter concluded with an Irving lob to Faried for a dunk. 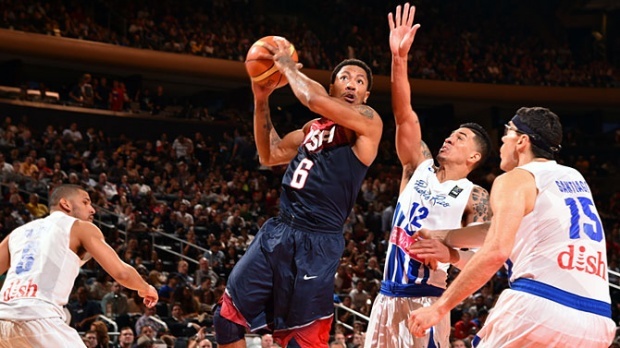 Rose was back in with 4:55 left in the second quarter and the USA ahead 36-21. He dove out of bounds trying to save a Cousins block and was fouled picking up a loose ball after the save. He made one of two. Rose later made a nice move on a baseline reverse but again missed the layup as he didn’t shoot from outside during the game. Rose made a sharp inside bounce pass to Faried late in the half. Faried was fouled, but missed both and the USA led 46-35 at halftime as Slovenia kept close with good shooting. The USA then took control after halftime. Late in the third quarter Rose turned the ball over on a drive. But he hustled back to prevent Goran Dragic from getting off a shot at the third quarter buzzer. The USA went into the fourth quarter leading 81-54 and Curry opened with a three for a 30-point lead the USA nursed the rest of the way. Rose again made a nice drive but missed a floater. He beat the perimeter later and found Thompson, his favorite target in this 4-0 exhibition start, for a right corner three.